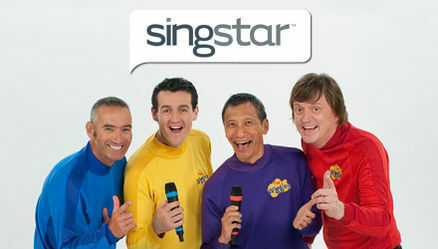 This is probably a partnership made in heaven... Singstar meets The Wiggles and with that said, boy, girls and parents… I now introduce you Singstar the Wiggles! As soon as we put the game in, we were treated to a very Wiggles orientated interface that has been designed with children in mind. At its core, Singstar the Wiggles is your standard Singstar karaoke type game for the PS2 which requires the player to match their words (or pitch) with words displayed on the screen. 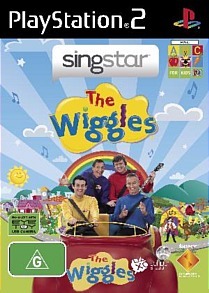 However in relation to The Wiggles, the beauty of this Singstar game is that many children already know many of these popular songs that grace this title, so even those who have trouble reading will have no difficulty in picking up a microphone and start singing immediately. Just be warned that you may need to wipe off the slobber from the mics! Apart from the user friendly interface, the star of Singstar the Wiggles are the 18 songs included om this release with favourites such as Hot Potato, The Shimmie Shake and my favourite (blush) Wake up Jeff! 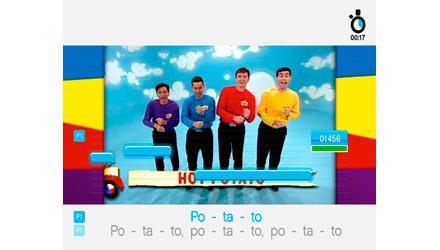 To compliment these songs, the player is treated to a variety of fun Wiggles videos which consist of Anthony Field, Jeff Fatt, Sam Moran, Murray Cook and even the original Yellow Wiggle, Greg Page. Want more colour? It's your as the player is also treated to Dorothy the Dinosaur and Captain Feathersword. 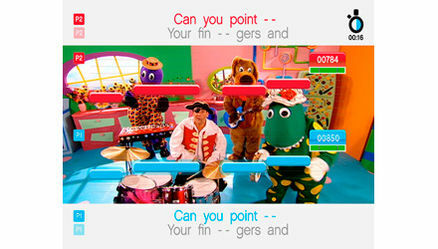 Even though most children are not a fan of edutainment, a little aspect of this genre exists in Singstar the Wiggles because children can link words to the song which in turn assists with their reading. And then you have the parents or even older children or young adults who have grown up with the Wiggles, makes this title (don’t laugh), the perfect party game. Thankfully we tested this game with some of our younger relatives and their friends and needless to say, it became like second nature for them. They navigated the game quite easily, chose their tracks and even sung together. Younger gamers may have some difficulties but fortunately the game is quite lenient if they miss a word or hum part of the song which still gets them through. In terms of other Singstar releases for children, like Disney, there are no real changes to the core mechanics but what made this so entertaining were the songs which are extremely memorable. Graphically, the title is apt on the PS2 with good quality videos and clear text. It does have a slight dated feel to it but for the majority of people who play the game, it should not impede in any way whatsoever. It’s probably a good idea that Sony released this for PS2 first because there are still millions of people out there with a PS2 and of course, it does work on the PS3. Personally, if you are a PS3 owner, I would wait until this version is released later this year but if you own a PS2 or can’t wait… well, best buy this title now. In conclusion, even though this game has been designed for the younger gamer, adults will get a kick out of this and as a family game or just for kids, it’s brilliantly entertaining. I’m surprised no one has thought of this idea before. It may not offer much in terms of gameplay changes (none at all really) to the Singstar franchise but as a concept, it works, especially with the high quality songs and track listing. Recommended!